Teachworks newest add-on allows you to make open lessons that students can join. The Lesson Enrollments Add-on is useful if you have classes with multiple spaces, drop-in sessions, or if you want to let students join a lesson on a first-come-first-serve basis. Once you’ve enabled the add-on, a checkbox is displayed on the form for scheduling lessons. Simply check the box to make the lesson open for enrollments. You can also set the number of open spaces in the lesson, or leave it blank for no limit. Student and family calendars will display a filter in the sidebar that allows them to show or hide open lessons. 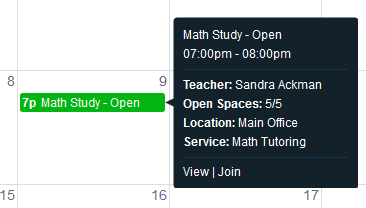 When set to show, all open lessons will be displayed on their calendar. For additional details, including the available spaces, the client can click on the lesson. To join a lesson the client can click on the lesson and then click the “Join” link in the pop-up. If the client is a family with multiple children, they can select which children to enroll. After submitting the form, the student(s) will be added to the lesson. If you’ve enabled enrollment notifications in the add-on settings, an email will be sent to your company with the enrollment details. You can find step-by-step instructions to use this add-on in the Knowledge Base here: Lesson Enrollments Add-on.